Spring and fall are two of the best seasons to visit the peninsula. The mountainous and picturesque landscapes become full of bursting and ravishing colors and scents. 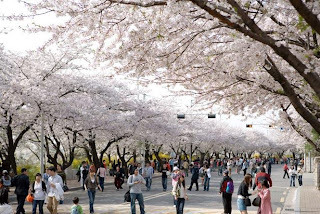 Starting this weekend, you will be able to enjoy more than 1600 cherry blossoms at Yeouido Island at the Hangang Yeouido Spring Flower Festival, on the backdrop of the majestic Han River. A sister festival is also planned, featuring some of Seoul's best street performers for dance, theater, and mime.